Its only August and I can already feel the end of summer in the air. I have been in the US for more than twenty five years and I still haven’t gotten used to the cold winters here. Every year just before fall sets in I start to panic at the thought of braving the cold winters again and at how I’ll lose my little veggie patch and that for a few months yet again, I not be able to step into my little herb garden and get a little bundle of flavor to experiment with! I do dry my herbs but somehow the fresh ones are always better. At just this point of doom, I decide that I have to maximize the use of my herbs while I still have them and start to use them in just about everything. 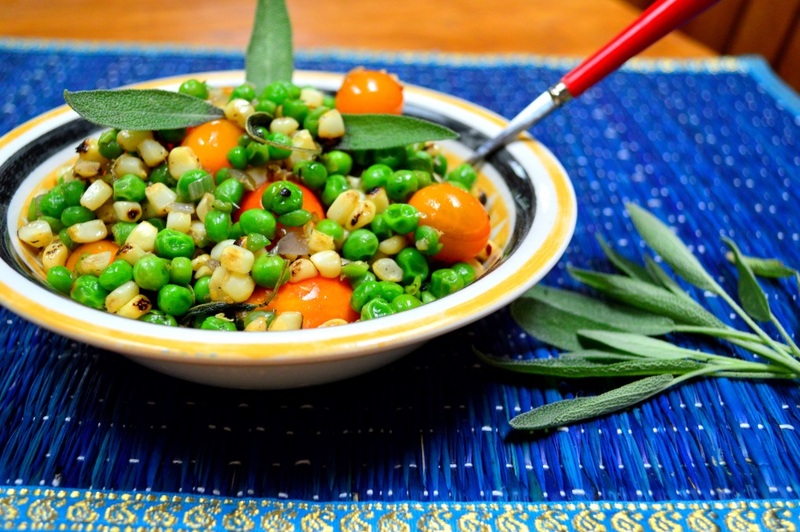 So today I fried fresh sage leaves in brown butter and added them to my bowl of vegetables namely roasted sweet corn and petite peas. 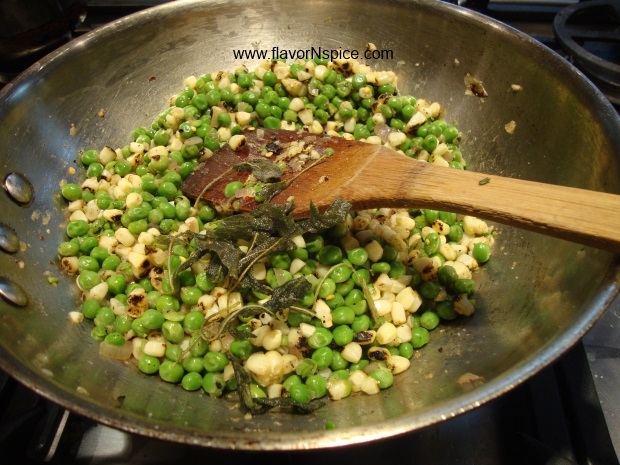 The combination of brown butter and sage is quite standard and it gave my vegetables quite a kick of flavor and deliciousness! 8. 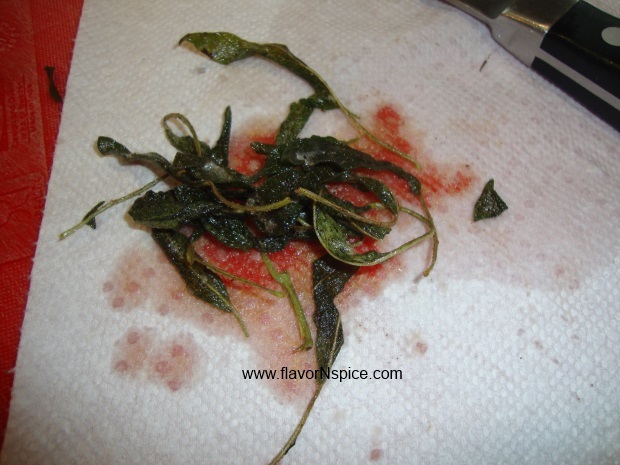 ½ teaspoon of red pepper flakes (if you don’t like your dishes spicy, you can delete this ingredient entirely). 1. 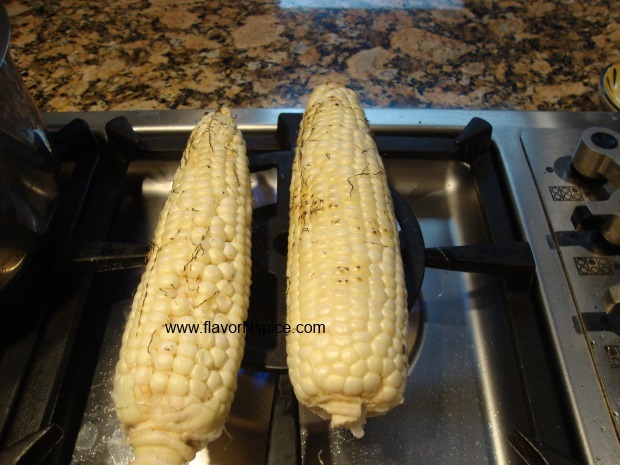 On an open flame, roast the ears of corn (charring some of the kernels a little bit adds a ton of flavor to the dish). 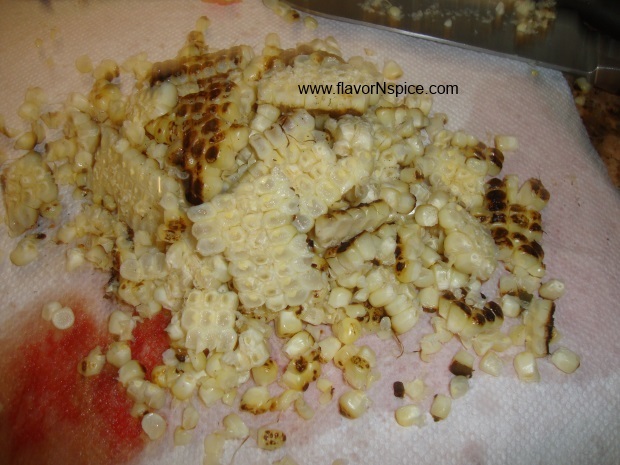 Just rotate the corn frequently so you don’t burn the kernels but just cook them enough to get the smoky flavor. When they are done, keep the roasted ears of corn aside. 2. 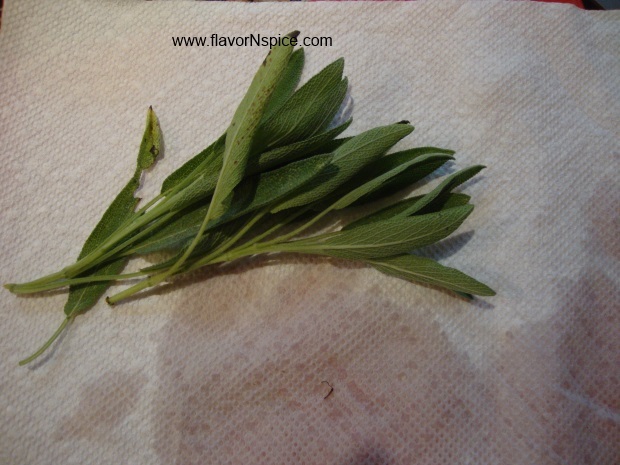 Wash the sage leaves and place them on a dry paper towel to remove any water on their surface. 3. 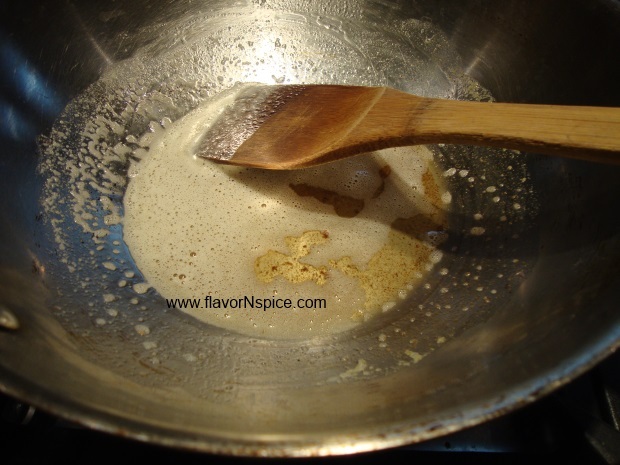 In a medium sized sauce pan, place the butter and start heating it on low heat. Let the butter come to a sizzle, continue to cook it till the butter turns a little bit of color and starts to look a little darker. You will be able to smell the brown butter smell at this stage. 4. 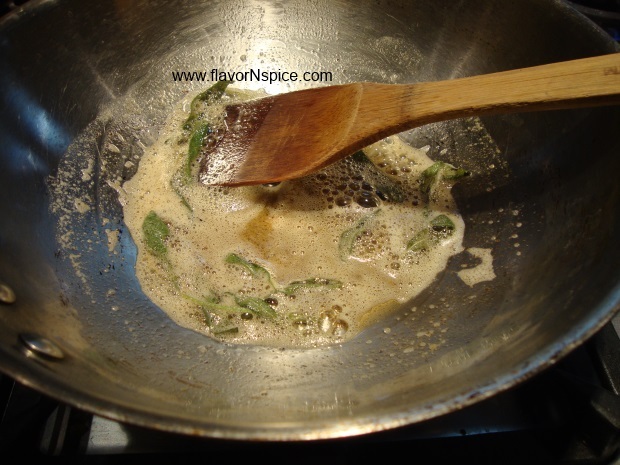 Add the sage leaves to the butter and let them cook for about a minute, till they get crisp. 5. Take the leaves out of the butter and place them on a dry paper towel. Let the butter stay on very low heat. 6. Peel and dice the shallot quickly (or the butter will get burnt). 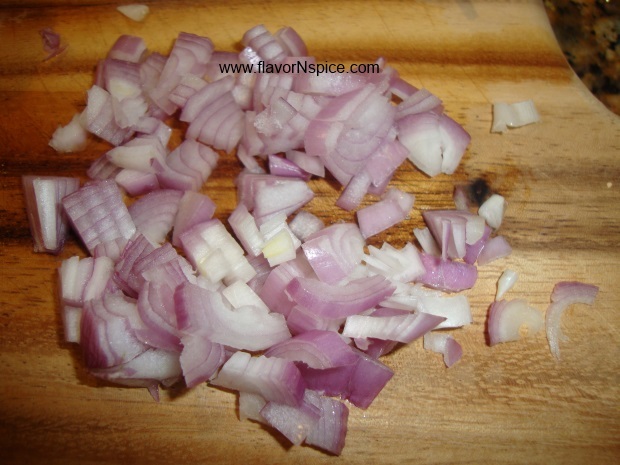 If you are slow at cutting, switch the heat off and then switch it back on when the shallots are completely diced! 7. Add the diced shallot to the pan and let the pieces get cooked for a minute or so. Continue to stir frequently. 8. 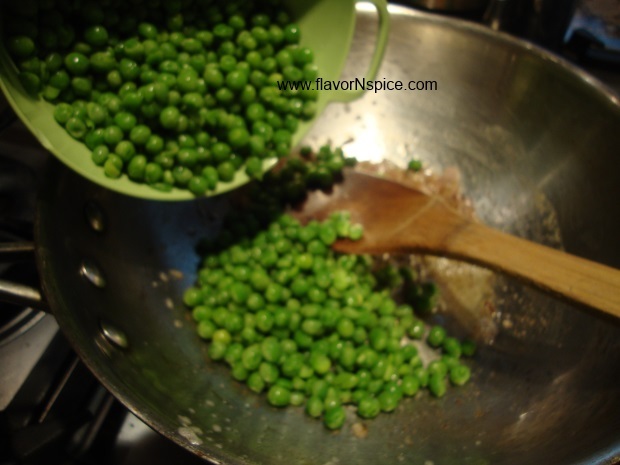 Add the peas to the pan and stir. 9. 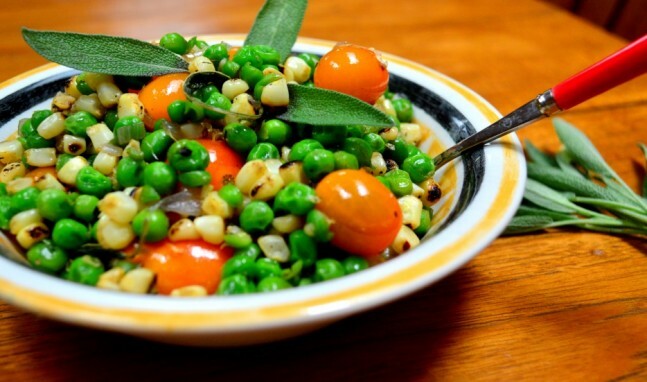 While the peas are getting cooked, with a sharp knife cut off the kernels from the corn cob. 10. Add the roasted corn to the pan and let it cook for a minute or so. Stir frequently. 11. Add the crispy sage leaves to the pan. 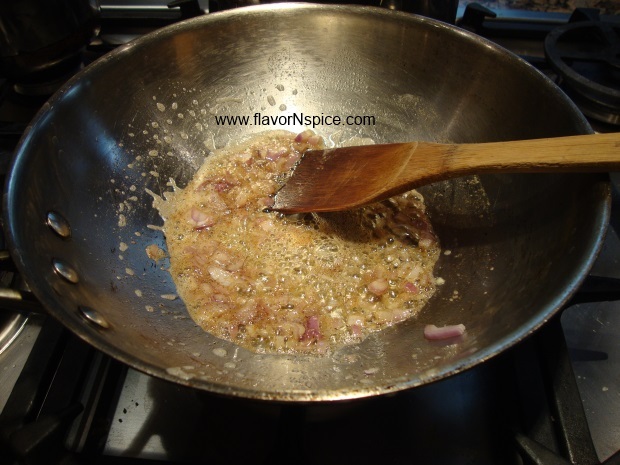 Also add the salt, pepper and red pepper flakes and stir everything together. 12. Switch the heat off and add the cherry/grape tomatoes to the pan and stir. 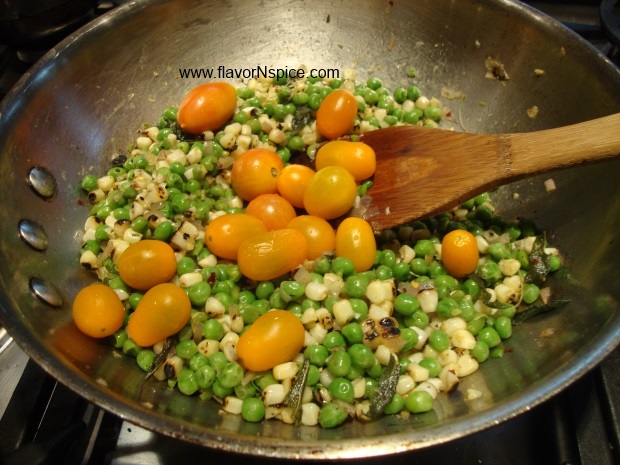 The heat of the peas and corn will soften the tomatoes a little. If you are going to serve the vegetable at a later stage, add the tomatoes just when you are ready to serve the vegetables. 13. Serve while the vegetables are still warm. They excellent as a side dish with any kind of meat dish such as steak or chicken (grilled or roasted). The sage and the brown butter give the sweet vegetables a nice earthy note.